Mailbox Math is a collection of ten interactive sorting activities that reinforce important PreK-2 math skills. 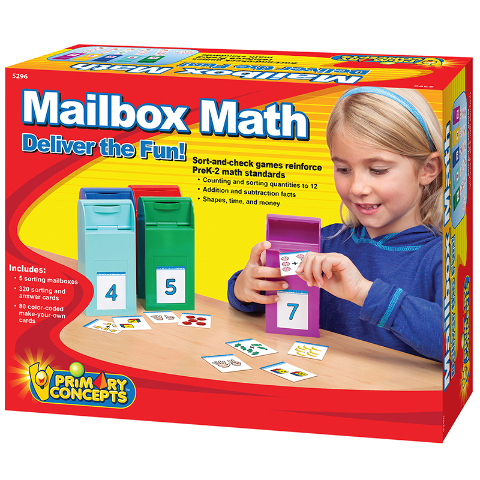 Young children love practicing math basics hands-on with these delightful, sturdy plastic mailboxes and colorful sorting and answer cards. The 5 mailboxes feature pull-down mail slots and secret sliding doors for emptying the mailbox and checking answers. Also includes 80 color-coded blank cards for creating your own sorting activities. Cards are printed on 8.5" x 11" sheets and require cutting. 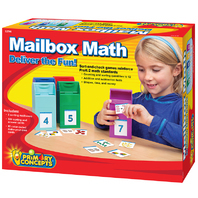 Includes: 5 sorting mailboxes, 320 sorting and answer cards, and 80 color-coded make-your-own cards.